SCADACore provides turn-key monitoring services for all industry and business. By providing SCADA with a Software as a Service model (SAAS), SCADACore Live hosting combines all the advantages of traditional stand-alone SCADA systems with no costly infrastructure costs. Monthly fees are based on devices rather than sensor’s polled with no additional charges for additional features such as web reporting, importing, exporting, callouts, gps tracking or multiple logins. SCADACore can collect data from thousands of devices using hundreds of different protocols. Reports are organized in user customizable dashboards with trending, maps, alert thresholds, and tables. Callout alarms can be triggered on escalating levels with reports sent by email or text message to multiple users. Exports can be periodically scheduled to send by email, ftp, or web service. GPS asset tracking available at no additional cost with all monitoring packages. SCADACore roots itself in the Oil and Gas industry developing the base engines and features to help serve the Operators, Accountants, and Engineers of the Industry. Our goal is to produce a product whose efficacy spreads equally across the field and the office. It is not acceptable to serve only one aspect of the industry, SCADACore strives to improve across all levels of operation to become the single provider of Oil and Gas monitoring. We will continue to develop innovative monitoring products to help improve efficiency in the field and reduce costs for our clients and partners. SCADACore designs our Industrial Hygiene monitoring solutions to meet our client’s specific needs. We work closely with the products our client’s choose to interface with them quickly using the SCADACore Collect Live plugin system. Environmental monitoring requires equipment to be robust and accurate to compare data over many years. Many of the sites SCADACore monitors are in remote areas that are difficult to get to in even the best conditions throughout the year. With the online remote monitoring and optional satellite reporting SCADACore can bring environment data back to you from anywhere on the planet. 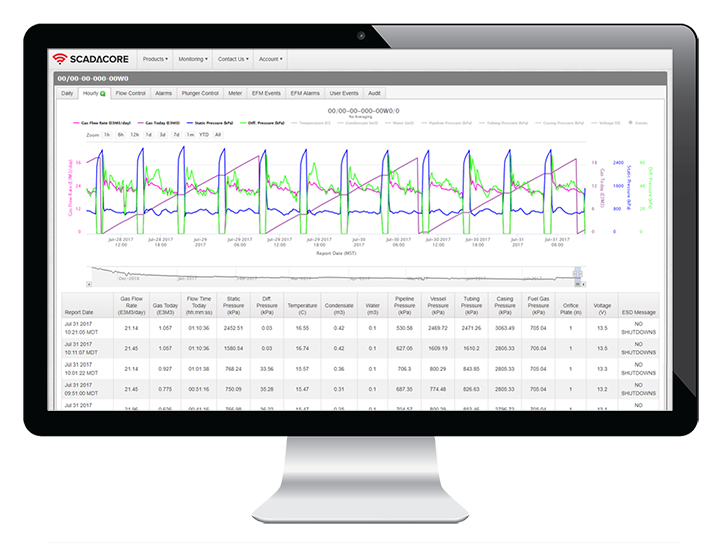 SCADACore offers our Industry sector clients the ability to monitor in real-time devices such as compressors, generators, turbines, tanks (hazardous and non-hazardous), and other machinery that is critical to your operations. With the escalating callouts offered by SCADACore Live employees can be alerted immediately if there is an issue with the equipment, resulting in a significant reduction in machine downtown. Combined with the ability to monitor and control remotely our clients can also save money by reducing “windshield time” of their employees driving to and from site. SCADACore Remote Surveillance is more than simply security. With motion activate Surveillance video users can be provided with real-time visual notifications if there is a remote failure on site. Water levels and air quality can be visual inspected from thousands of miles away keeping your residents and employees safe.